The drawing classes are recommended for students at Art One Academy so they can prepare themselves for any other courses in visual arts. Anyone can learn to draw. It just takes practice. Learning to draw can be frustrating at times, but in the end, you can’t beat the feeling of pride when you see your first successful drawing. We live in 3-D world. All objects no matter how small or large, have heights, width and depth, however drawing are created on a 2-D or flat surface. When you look at a drawing or a painting, and see that it looks real, what you are observing is that the artist has created the illusion of three detentions on two dimensional surface. Creating this illusion is one of the goals of good drawing. To create the illusion of three dimensional space, students use shading to create a sense of volume rather then drawing outlines of objects. And this is what our students learn at our drawing classes. Featured work: Iris, 8 years old. 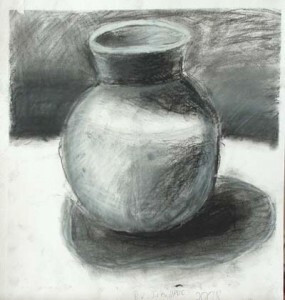 This vase was an advanced assignment for Iris after she has learned how to draw basic geometric shapes. That is the work of a EIGHT year old KID.